The horror genre needs some help. It seems like every year an endless array of movies and video games come out that primarily focus on bloodshed and mayhem. If you're tired of these recycled ideas and enjoy classic ghost stories, try playing Papa Sangre II. The unique aspect of this iPhone game is that it is meant for your ears nor your eyes. Instead of relying on traditional graphics, the game developers Somethin' Else decided that Papa Sangre II was going to be an audio-only experience. After you plug in your headphones, the first thing you learn is that you've just died. You then travel through a dark and dangerous world, collecting forgotten memories in order to return to the land of the living. 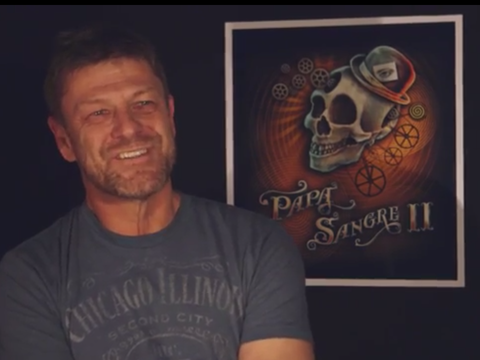 Soon, the haunting voice of Lord of The Rings and Game of Thrones star Sean Bean filters through your speakers providing guidance as an increasingly unreliable narrator. Your iPhone or iPad screen remains dark most of time since each level requires you to follow a particular sound to complete it. The controls make you tap the lower corners of the screen to keep walking forward. If you hear a noise coming from the left or right of the screen, you'll be safe. However, obstacles will occasionally appear in front of you like a monster or other souls who want to possess you. In order to scare them away, the dark screen will light up with the options asking you to clap your hands or shoot your gun. Ultimately, the powerful sound quality of Papa Sangre II turns your imagination against you. It is much more frightening hearing something coming after you instead of actually seeing it. Download the game for $4.99 from the app store and watch the video below to see the game in action.